Science. Technology. Engineering. Art. Math. The moment I saw this photo, I thought, “That screams STEAM”! Particularly when I think of the aesthetics of Art. Have you gotten used to calling it STEAM? Do you still say STEM? I know. The first time that someone called it STEAM, I thought that they had added a little something “extra” in their teacher mug. LOL. Yes, we must get used to adding the A for art in the description. Along with that, you may be adjusting to implementing STEAM into your regular curriculum. Right now, our school is easing into the process. Activities are being rolled out to classroom teachers on a bi-monthly basis. We are working on activities in collaboration with the Technology and Gifted teachers. They plan and set up the activities, and the classroom teachers act more as a support and monitor. Eventually, it will be each classroom’s teacher responsibility to incorporate STEAM into their lesson plans on a consistent and independent basis. If you are easing into STEAM like I am, I would like to share a list of a few tips that I hope will make the transition more seamless for you and your students. 1. Introduce STEAM to your students. Make it sound as exciting, cool, and mysterious as you can muster. Your excitement and level of intrigue will ignite their curiosity. Believe me, the minute you mention science and construction, you will have them hooked. They won’t even hear anything else that you have to say after that. 2. Tie STEAM in to something else that you are already learning about. Fairy tales, a biography about a historical figure, etc… make for great jump off points. They will be excited and more engaged about extending their knowledge on a topic that they already know something about. This will help to increase their level of comfort and help to maintain their attention. My class completed a STEAM project on Johnny Appleseed where they had to construct a raft out of various materials to get him safely down the Ohio River. This was during the month of September, so students were excited to see that our project was about someone that they knew a lot about. This is one of the rafts that my kids created. Way to go, guys! 3. Thoroughly explain the 4 Cs of STEAM. One of those C’s will be key to the success of your STEAM activities. Collaboration! Collaboration! Collaboration! Discuss sharing responsibilities and respecting other people’s opinions even when they are different from your own. How can students find a compromise, or happy medium? 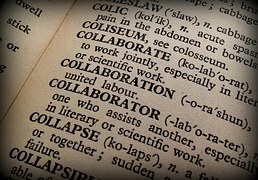 Positive collaboration is vital to successful and thought provoking collaboration. Encourage students to talk and share their ideas respectfully. 4. Place students in groups of 4. These groups will be teacher-created. You know your students well. Consider personalities, strengths and weaknesses. Think of placing students with students that they wouldn’t normally pair themselves with. Of course, this is a personal preference. You may want to allow students to select their own teams. 5. Provide a variety of “possible” materials. Having pipe cleaners, tissue paper, toilet tissue/paper towel rolls, popsicle sticks, rubber bands, round candies with holes in the middle (great to use as wheels), glue, tape, Legos, clear, plastic cups, toothpicks, and any other materials for constructing. Collecting these items throughout the year, or asking parents and staff members for donations, is a great way to build up your available supplies. 6. Facilitate, but don’t teach. Be available for support. When asked questions, re-direct questions back to students, when applicable. In other scenarios, ask leading /guiding questions that may help gear students in a better, more helpful, direction when needed. Automatic teacher involvement= non-collaboration or any harmful exchanges or interactions between students. 7. Make sure that all students understand the task that they are being asked to do and any requirements, restrictions, and/or responsibilities related to that task. Behavioral expectations and how to retrieve needed materials are also discussions that should be shared with students. Those are some of the key steps that you will need to get STEAM up and running with your students. I hope that you found the 7 tips that I shared to be helpful. I have also created a set of STEAM Planning Sheets. Students can use these to collaborate, plan, and design their STEAM project. I hope that you will find them useful. Click here to get your FREE STEAM Planning Sheets! Every Day is a Great Day to Celebrate Crayola Crayons! next article: Do Your Students See Themselves In Your Classroom? Tania, this is awesome! And to think that you do STEAM with 1st grade is so impressive!!! Great tips for teachers of all ages! Hello, Andrea! Thank you for taking the time to read my post and for leaving a comment. So glad that you liked it. : ) I actually do like Science, so STEAM can be a lot of fun. Thanks for posting this article. I have yet to start calling it STEAM. I keep trying to remember. 🙂 The tips you shared are wonderful and I love the sheet. Thank you! Thank you so much for sharing your thoughts on my post. I know, I sometimes feel as though I am the only person that calls it that. It has officially been renamed STEAM at my school, so I use that term most often now. : ) I am glad that you loved the information and the sheet! Thank you for stopping by. I hope that you will visit often.